When in search of the ultimate example of a charmed life, look no further than Alexander Gilkes, the dashing British-born founder of tablet-based auction service Paddle8. His assured ascent to the most revered echelon of the art world was almost dangerously swift. After becoming one of the youngest-ever executives at LVMH (he worked the Krug account, which means he chartered the private jet to Paris with Jay Z on occasion) and then moving to Phillips auction house (he was Simon de Pury's protege, and still handles the gavel at big sales) Gilkes co-founded Paddle8, which has secured funding from major venture capitalists and friends such as Alexander von Furstenberg, Damien Hirst, and the Mellon family. Paddle8 launched in mid 2011. In 2013, the company will record $40 million in sales, and boasts a company of over 40 employees. Now 34, Gilkes is a dapper and dashing Eton-educated Brit who has close ties to the royal family through his brother Chris, an old Eton chum of Prince William (and one of Pippa Middleton's former boyfriends). What's more, he recently popped up in the tabloids for hiring Princess Eugenie of York as a new Paddle8 employee. When he married Misha Nonoo, the gorgeous 26-year-old fashion designer, they held the reception at a 16th-century fort in Venice that had never been used for a private event. The ceremony was attended by Helen Rockefeller, James Middleton (the duchess' brother) and Lana Del Rey (who performed), and was given a full spread in an issue of W.
So, with this pedigree, it can't hurt to be extremely sartorially inclined. His natty but casual sense of style landed him on the Vanity Fair International Best-Dressed List this year. And because Paddle8 hosted the Chandelier Creative holiday Friday night, let's take a quick look at a few recent outfits. 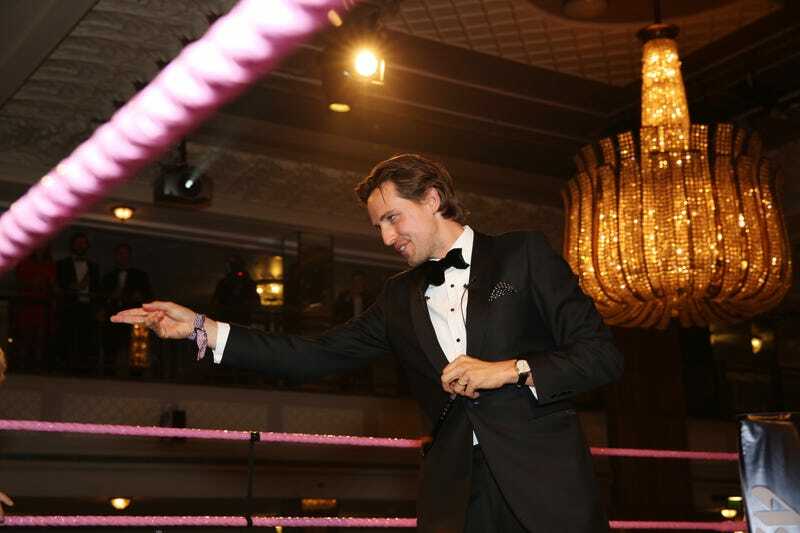 In the above photo, Gilkes is pictured at the Boodles Boxing Ball, an annual black tie fundraiser in London, wielding the gavel as he shills monstrously expensive art. Notice how he is very active as an auctioneer, yet his tuxedo is never less than crisp. Nice work. And there's a polka-dotted pocket square that would almost always seem like a mistake, but, here, it works. Next is another auctioneering gig, at the Creative Time Spring Gala Benefit. Back in the States, Gilkes seems to be embracing his casual side as the warm weather hits: open collar, blue blazer, pink pants. A timeless combination. And, last, here's Gilkes ever slightly more casual, slightly windswept on the rooftop of The Standard, East Village. It's a Paddle8 party, celebrating the 150th anniversary of BAM, so he can pretty much get away with anything, and in this case, it's a grey cardigan. It works. And so, as Paddle8 continues to expand its influence in the art world, expect Alexander Gilkes to rise with it. Clearly, he's a man to take style cues from. Just don't forget the pocket square.